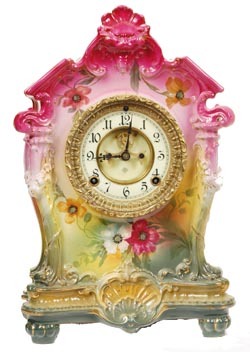 Ansonia Clock Co., Royal Bonn, "LaTosca", ca 1904. This is another colorful, tall case. It is 14.5" high, and 10" wide. Colors, like No. 387, start with red-rose on top, changing to light green then dark green on the base. A lions head on top, small open space might be a snake? or varmit of some kind, on top of an urn which changes to a tree? Strange, it could be anything. The flowers are white, yellow, and red. The usual gold accent painted mostly around the base. Ly-Ansonia, page 635.